Save 20% on the list price when you buy direct from us. Use code tpdirect at checkout for a 20% discount. It's well known that human beings are allergic to change. This is nowhere more true than of human beings in organizations. Organization Development initiatives... Leadership Development programs... Business Transformation plans... all founder too often on our resistance and reluctance, on the tendency of people and things to slip back to how they were before. For a long time, Systems Thinkers in general (and Power+Systems pioneer Barry Oshry in particular) have understood that the problem lies with our failure to look at the surrounding organizational structures and dynamics, at the wider picture, at the context. In Context Context Context Barry Oshry draws on a lifetime's experience to explain the nature of the problem with our organizational structures... and the ways in which we can dissolve the problem. The book is written in play-form: a simple briefing conversation between a recently hired team member (HE) and the Chief Contextual Thinker (SHE) for a Business Consultancy firm. They discuss the change initiative they are running for a key client. The conversational format allows Oshry to introduce all the relevant theory clearly and in sequence and allows him to address questions and misunderstandings as they arise. The result is a guide to Systems Thinking for Organizations that's as short, clever, engaging, bright and helpful as any business book you will ever have picked up. Do read it. Get it into the hands of teams and team leaders, trainers, HR people, senior managers and chief executives. Read it in a day. Transform your understanding of people in organizations for ever. This is a story with the potential to transform any organization – to bring us insight into who we are and what we will become in all the systems of our lives. It is written for anyone interested in the workings and structures of human organizations: from Board Directors and Chief Executives, through Middle Managers to interested workers. Human beings are profoundly social creatures, participating in a huge variety of human (and other, wider) systems. Those human systems may include: family, team, organization, community, nation, faith group, political party, volunteer association, and more – yet we are blind to how these systemic contexts shape our lives. Context-blindness is costly. It results in debilitating personal stress, broken relationships, lost opportunities, diminished contributions, and destructive interactions within and across systems. It is the place where our hopes, and dreams, and ambitious projects go to die. 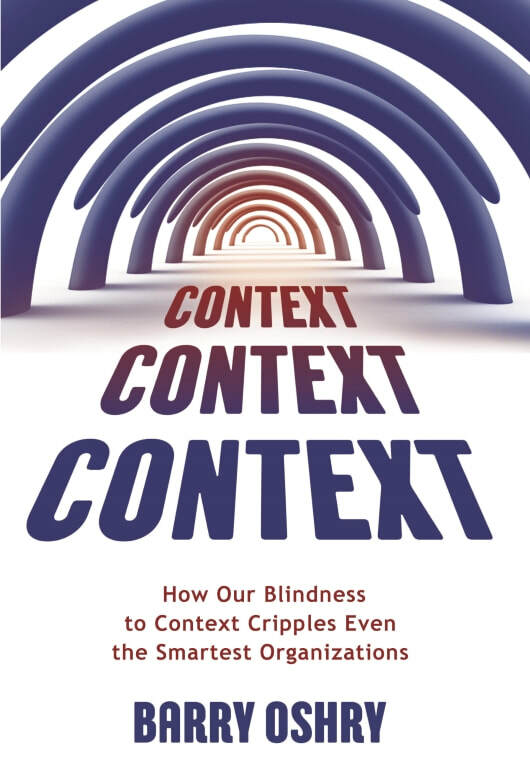 In Context, Context, Context, Barry Oshry shows how context-blindness paralyzes organizations – stalling change programs, undermining communication, sabotaging teamwork and entrenching unwanted and unhelpful divisions. Context, Context, Context tells the tale of a single organization in its struggle to achieve excellence. The story illuminates for all of us the power that comes from transforming context-blindness into context-sight.